Back in the early 80s, anyone dressing in the American style, whether a vintage ivy league look or in the then current preppy style would have been familiar with and almost certainly owned at least one surcingle belt. “A surcingle belt is a belt having a web body with leather fittings on either end and a frame style metal buckle. The web is usually a heavy wool twill and may be solid colored or longitudinally striped, or embroidered with a repeating motif. The leather ends are sewn onto this, and are generally narrowed. You can be sure this entry was written by an American because despite being part of the transatlantic influence of British traditional dress on the Ivy League style, virtually no one you speak to in England has ever heard of a surcingle belt. Sure, they’ll know what you’re talking about if you describe it, and may well own one, but without any thought to what it is, the history of it and certainly never calling it by its American name. In most cases, it will have been acquired as a re-imported element of the globalisation of American style – the ‘chino belt’ or some such misnomer – often a cheap plastic-ended version coming free with the trousers at low end retailers like Marks & Spencers. On the other hand, there will be a whole bunch of owners who know something of this style from its British military origins, where a cotton or wool ‘webbing’ belt might be made of regimental colours as a reminder of past glories. However, in the USA, the surcingle belt once held its own along with the button down shirt and the weejun as ubiquitous objects of the boom years of ivy style. The first one I owned was (inevitably in early 80s London) from John Simons. Made by the Regent Belt Company, a British maker with a long history. 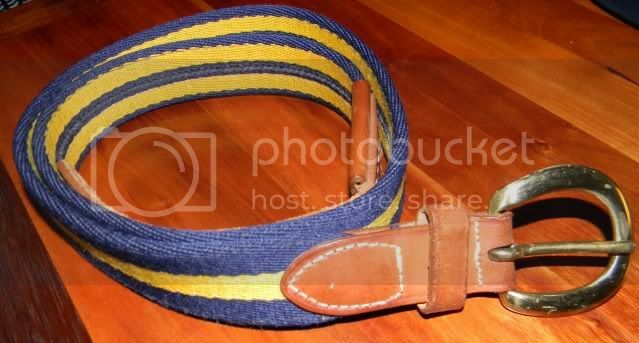 This would have represented one of the company’s mainstays in the export market – coloured belts in cotton or wool with natural (British tan) coloured leather ends and a curved horseshoe shaped buckle, similar to that used for horse tack. That belt was a classic 3 colour horizontal stripe of navy, red and green. It was pretty expensive back then too, something like £24.95 – a big ticket back in 1983. If memory serves it was also my only belt for years, worn day in, day out until it acquired a well worn patina which give it that uncared for look that ivy so behooves. From the surcingle belt, I graduated to the complex woven leather version popular in the late 80s (it’s worth noting here that along with many of my contemporaries in London, we looked for our style tips to American tourists and businessmen, who in those pre-globalisation days stood out instantly). For many years after, I adopted a wider heavy leather belt with solid brass buckle, good for jeans and vintage chinos. Then as often happens, somewhere over the years, the surcingle began to disappear as a distinct item. Sure, it was always ever-present in some form or other from Ralph Lauren, (keeper of the flame during the dark years of many an item, madras included), or would turn up from Lands End or even Uniqlo. But these belts were usually a nod to the originals, and over the years almost every maker has moved away from natural tan leather to a deep dark brown. Now, when you search either in store or online, almost every belt has the leather in this colour. The few examples that do go for a natural tan seem to have decided that the original horseshoe brass buckle is not good enough and moved to somehow variants on unnatural squared one. Back in the day, alongside imported items from such as Regent Belt Co, the US had its own makers of distinction. Trafalgar and Canterbury are both names that will bring back memories to Americans of a certain vintage. Both are still in existence but in the modern offshore brand-only sense. Coach also offered surcingles as of course did Brooks Brothers and J Press. Press still sells them with tan leather ends but in a nod to America’s collective size increase in an unnecessarily stretch fabric. Away from the fashion world, Orvis cornered the market for emblematic versions featuring marlin or ducks or other Trad fetishes. Another retailer of surcingles was O’Connells of Buffalo. However, unlike most of the others, O’Connells actually still sell Made in USA surcingles in all the right colours, including some wonderfully garish tartans and madras. Judging by the images on their site they are exactly as they always have been. I say judging by that, because I’ve just ordered three of them and I’m hoping that O’Connells’ famously never updated website has the photos of the actual items. Because most of the US made surcingles still available, such as those from Dann Online, are made by a New Orleans company called Torino Belt Company who seem to have recently jazzed up their buckles for an altogether less attractive version. Another vintage Canterbury with its distinctive horseshoe buckle. It would be interesting to know which British firm made them. Search on eBay, the one place where you can find pretty much anything you ever wanted these days, and the term ‘surcingle belt’ is woefully under-represented – just three items on US Ebay as a I type! The name seems to have dropped from the lexicon on modern clothing. Some of the most decent modern ones are actually by global teen brands RL Rugby and Jack Spade – at least they get the look right, but they’re way overpriced for offshore items. Last Season's Jack Spade Surcingle has the right details and Made in USA. Shame no stock left then. Belts are also something that has always been disproportionally expensive when compared to other leather items. True, a well made leather belt can be hand cut and stitched, but 95% of leather belts are not that complicated to make and the cost bears little relation to the amount of work involved in even a basic pair of shoes. However, here again the O’Connells versions triumph, because the prices are the same that I paid John Simons back in 1983 – $40 for a the cotton version, $50 for the wool version with madras coming up somewhere in between. As with their wonderful Shetlands, O’Connells also have a bewildering number of colour options to choose from. It took me a long time to settle down to just three. I thought that three would be enough to last a good decade or so and allow the natural tan leather to break in nicely over the coming years. After writing this post, I also picked up this Dooney & Bourke vintage version, with a very different but still attractive buckle. Oddly, listed by the seller as a woman’s belt (I suppose 34 waist is uber-slim for many American women these days!) it is of course a men’s 34 and clearly stamped as such. I do love it when seller’s misdescribe things. Having said that it was not cheap, but I like the green and what I presume to be pink stripe. Like fashions in tartans and madras, the webbing on a surcingle often speaks of its vintage. Here are some photos of the surcingles from O’Connells. The striped one is stamped ‘O’Connells’ on the inside of the leather tab, and the other two have Leatherman tabs. Am really pleased with all them and would definitely order more. It’s confirmed that they are the same as the ones available from Eliza B and that they can switch the buckles on the order form, to these traditional shaped ones. A great spin through the world of surcingle belts. J Press still offer a good range of surcingles in their shops for $45 – $50. Unfortunately the selection on their website is limited and only has the square end buckle. Thanks for an excellent write up. Thanks Andy. The website seems to only cater for the stomachularly challenged needing elastic. Haven’t been into a J Press store for over a decade now apart from concessions in Tokyo. I’m always on the lookout for a good surcingle, having decided that I didn’t like wearing a leather belts with chinos. I have tried the military style webbed belt (like Eastman leather sell) but I think that they are too boring now. Thrifted a couple at the weekend, but neither are perfect. One made in Exeter, New Hampshire, but with the Emblematic Trad style and all its associations. The other made in Italy for Bally, very modern European. I think the horseshoe shows integrity by having a nod to the belts origins. JS had some in, made by McRostie of Glasgow, I think. Presumably a special order, as they only have leather belts on their website. They turn up in the oddest of places Michael. The recent JS ones are very dark brown leather without the ‘feathered’ edge stitching. Cordings sells similar ones that look identical to Smart Turnout. All of these UK versions cost more than the Made in USA ones even after shipping! FYI, I just contacted Eliza B. and they can switch out the buckle if you want more-traditional round buckle with your more-traditional feathered edge. Said to just add it to the comments form. Thanks Jovan, that’s good to know. I suspect that the O’Connells belts are from that source, too. Where can I can order belts like this in the UK? Great article by the way! Short answer is: Nowhere! Best bet is to order from O’Connells or direct from Eliza B / Leatherman website. YRI Designs of New Hampshire make very good belts. Good leather and good buckles.Mainly trade but I just wrote to them asking if they do retail as well. So many belts. . . So little time. The one with the blue and gold is my favorite.